We provide ‘The Essentials’ – food, clothing, shelter and other critical services to those who are in need. This inclusive service is open five days a week. Our Community Pantries provide healthy food and personal care items to individuals and families in Canberra who are experiencing hardship. 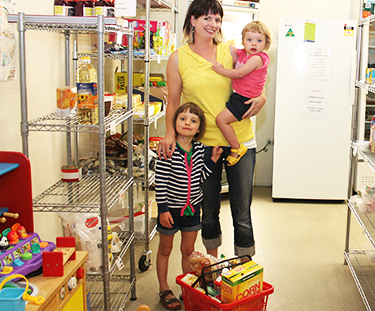 The pantries are located in the Tuggeranong Community Centre and Gungahlin Community Centre. Please make an appointment to access Crisis Support. Communities@Work’s food programs receive no ongoing ACT or Australian Government funding and relies on strong corporate and community support through sponsorships, philanthropic grants, fundraising and donations. Click here to find out how you can help. We rescue excess food from licensed food businesses and retail outlets. Food rescued by Communities@Work is utilised in our Community Pantries and also provided to a broad range of other agencies including domestic violence refuges, disability support services, homeless shelters, mental health support groups, agencies supporting people with drug, alcohol or gambling problems, refugee programs, school breakfast programs, and other programs assisting those who have financial difficulties. We can only accept pre-prepared food from registered food businesses. We appreciate and gladly accept non-perishable items in original packaging, within the use by date. Your donations can be dropped off at the Gungahlin or Tuggeranong Community Centres (open between 9am and 4:30pm), or at our donation boxes outside Woolworths and Coles at South.Point Tuggeranong; outside Woolworths at The Calwell Centre and next to the lift at Cooleman Court. Our Best Dressed Store is located in South.Point Tuggeranong and sells clothing to create sustainable and ongoing funding to help vulnerable clients through our Clothing Program and other social programs. Find hidden treasures of women’s and men’s high quality, pre-loved, special occasion and work-ready clothes and accessories. Prices start at only $5. For many who are unemployed, on low incomes or who have experienced a life changing event, it can be a real struggle to meet the cost of suitable clothing for the next job interview or to commence new employment. Our clothing program provides men and women in need with free clothing, shoes and accessories for job interviews, work experience or other special events. Our volunteer cooks prepare nutritious meals for our Community Pantries. 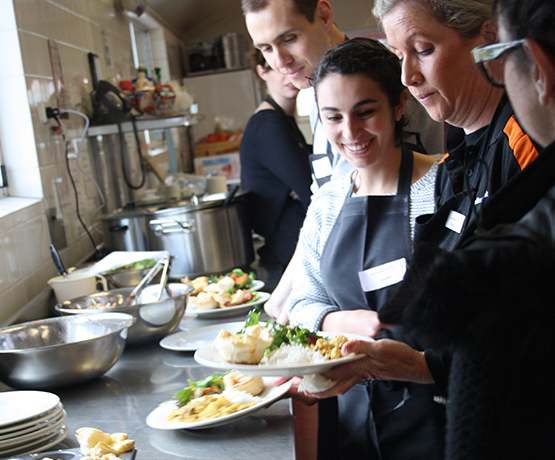 We also conduct cooking lessons so that clients can learn how to cook healthy and low-cost meals for themselves and their families, thereby enhancing their well-being and independence. We provide support for individuals and families who are, or are at risk of being homeless and provide transitional accommodation for people in need, including those escaping domestic violence. We can provide bedding (subject to availability), access to showers and also shower packs and meals for people who are ‘sleeping rough’. Our Reach Home program is one of a number of specialist homelessness services that receive funding under the National Affordable Housing Agreement (NAHA), jointly funded by the ACT and Australian governments. We receive referrals from OneLink and provide safe, transitional, supported accommodation for families. We also provide outreach support as required. In addition to our food and clothing services, we help people address immediate basic needs in times of crisis. We provide Telstra vouchers, bus tickets, sanitary items, nappies and assistance with chemist scripts (all items subject to availability). These services act as a safety net for people experiencing financial distress or hardship and who have limited means or resources to help them alleviate their financial crisis. Canberrans who are experiencing hardship, who need support or who simply do not know what to do next, can also walk in and talk to us. We offer referrals and are often able to provide information on other services available in the community. This service is available from 9am to 3pm on Monday to Friday. Communities@Work can also assist with information and referrals to other services.